I think this pic gives the answer much better than my words. N Thanks for the wishes. Yes, rightly guessed, but No prizes. 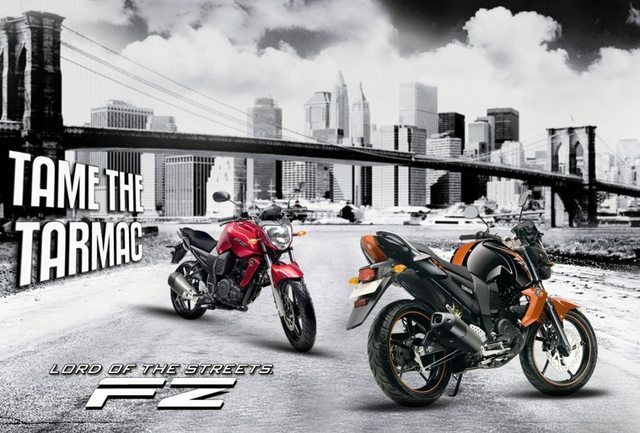 But only a ride of my FZ-S.
1. Yes, its much better than previous one. Rear-grab rail is also new & now it doesn't intrudes into the Rear passenger thighs. 2. Max 55kmpl reported till to date on Mixed driving cycle. Shocked & Surprised. I bought it with assuming its FE 45kmpl max . 3. To me its a Japaneese KTM. No comparos till to date. 4. Electricals locking, Keyless start-stop, Burgular Alarm with Shock sensor & Parking detection. Still FZ is the muscular of them all. n Simply I'm lovin' it.. I am new to the forum and saw the post this minute. What's thrilling me about your response is the mileage that you mentioned. Does it give 40+ ? Even now? Yes it gives 40kmpl with ease, but all you need is to control your right hand on accelerator, as this is a very comfy, powerful & stable bike, so speed come often with this bike, which inturn reduces its fuel efficiency. Minimum fuel efficiency returned till to date: 35kmpl(with driver+rider @80-90kmph on highway). Maximum fuel efficiency returned till to date: 50+kmpl(driver only @40-45kmph). FE on my Shimla trip last year on it: 40kmpl(driver+rider+2 shoulder bags) on both Plains & Hilly Highway.